Our raw food organic Noni Fruit Leather with 165 beneficial compounds is used to help support overall health, wellness and energy. Noni fruit is a Polynesian superfood that contains over 165 beneficial compounds in its raw form. Noni is a tropical tree known scientifically as Morinda Citrifolia. The true traditional use for thousands of years among Polynesian cultures was to eat the raw fruit to maintain overall health and wellness. Noni fruit contains vital micronutrients, including natural antioxidants, soluble and insoluble fiber, essential fatty acids, and countless other vitamins and minerals, which work together to promote good health. From our organic family farm comes the healing power of noni. Our Noni Fruit Leather is made from 100% non-fermented organic raw noni fruit pulp. We use a unique low heat drying process to maintain the beneficial enzymes and compounds for maximum potency. Published research has shown Noni Fruit Leather to be 14x more potent than noni juice. It is raw food with absolutely no additives or preservatives. Each package of Noni Fruit Leather has a 2 year shelf life not refrigerated. Noni fruit is believed to be so effective because of its natural antioxidant abilities. What's more, the natural antioxidants in Noni fruit help revitalize the body and eliminate free radicals. Other functions of noni fruit include promoting healthy cardiovascular, nervous and immune system function and helps support the overall health of the digestive system and the GI tract. Can Noni Fruit Help You? For basic maintenance (to keep yourself healthy) simply take one 2 inch by 2 inch piece per day. For persistent conditions take two to four 2 inch by 2 inch pieces per day. Start with two pieces per day and if you are not getting the desired results simply up the dosage to four pieces per day. Take half in the morning and half in the evening as raw food. Noni Fruit Leather can be consumed in many different ways. The simplest way is to tear off a piece no bigger than four square inches (2 inches by 2 inches) and simply sucking on it to let it dissolve in your mouth. We accidentally came across this Noni farm on our last trip to Kauai. We weren't interested in the product, initially, as we were just curious about the tour and how an organic farm works. However, after taking the tour, I bought some of the fruit leather and the icyheat noni lotion. In just a few days after using the lotion my severe neck arthritis pain was gone! At first I thought it must be a fluke or something else that I was doing. However, I quickly noticed that if I missed an "application" then my neck pain would return, including numbness down my arm and into my fingers. I also take 3-4 noni leathers/day and I am a new woman! The doctor's can't explain it, as they had me ready for steroids and surgery. I know this all sounds too good to be true (I can hardly believe it myself still), but the results of this have been absolutely amazing for me. Thanks Steve and Family for your dedication and for making this great product. My name is Maggie Wise, from California. My husband & I were on your farm back on September 16th.. I have made up a fruit smoothie that I add my Noni leather to every morning! I use fresh fruit juice ( I prefer pineapple juice) frozen fruit (which I buy local, I cut up & freeze my self) then a tablespoon if Greek yogurt I add 2-1x1 squares of Noni and blend it up! It is super tasty & I get my Noni fix for the morning! Thank you for making such an amazing product! So much better than noni juice! I love your product. I have been using Noni for 6 months now, but like the Noni Leather the best. A friend advised Noni juice from Tahiti about 6 months ago. I had been using Noni-Juice Plus and Noni Pacific, both from Tahiti, but I found Noni leather to be significantly better. I use the lotion too on sore muscles. My entire life I have had stomach problems and have taken many prescription medicines, but none have worked as well as Noni. Noni gives me immediate and lasting relief. I bought the Noni-Pacific at Whole Foods and orders the Noni-Juice Plus from the internet. Both products, although aided my stomach, they also both constipated me. While visiting Hawaii, I purchased the Noni Fruit Leather and found it also aided my upset stomach immediately, and didn't have any negative side effects, as the other two had. Also, Noni juice is difficult to travel with, as it must be refrigerated. Noni leather can be taken anywhere and stored easily. I have found this to be the best Noni product that I have used and will continue to use Noni leather and lotion. Thank you for making such a great product! I have been very pleased with the noni fruit leather. It has been quite effective over the last three months. This has been in contrast to no reaction from other formulations of Noni which I have tried. Whatever is going on in the processing there is a big difference between the liquid and dry powdered noni I had tried previously and something that is in a more natural state. Clearly your product is different and superior in quality. Feeling GREAT since using Noni fruit leather and Noni Icy heat sports lotion. I have been using Noni fruit leather and Icy heat sports lotion for about 2 months now. My knees haven't felt this good ever ( I had both knees replaced and have had pain ever since). Knees were replaced about 3 years ago. I recommend this product to everyone. I am amazed how FANTASTIC I have been feeling!!! I know it works when I miss taking it! Two years ago, my boyfriend and I visited Kaua'i for the first time. We happened into a farmers market at the end of the day, and I was immediately drawn to the booth where they were selling the Noni products and signing people up to tour the Noni Plantation. I signed up, but my boyfriend was not interested. The next day I was dropped off for the tour. It was good to meet the people behind the product and to meet the loved Noni trees themselves. I came away convinced and dropped a bundle on products. Well, my boy friend probably rolled his eyes, but I was determined to give it a fair shot. After all, I have been doing this sort of thing all my adult life. Trying out natural remedies for what ails us as a human race. So I started taking the leather because we were doing some challenging hiking, and after a day I was noticing a difference. So, this stuff seems to work while you are in paradise, lets see if it works on Northern bodies in the winter! Well, I am here to tell you it does! Remarkably well. I am 65, an active person, I have a massage practice and I teach yoga. I am already in the self-care field, and this is one of the greatest assets I have. I have introduced Noni to many of my clients who now use it regularly and I use it in massage. One square of Noni in the morning, and I will take one in the evening if I am particularly active during the day. Mother Nature has wonderful nutrients, I am so grateful to Steve, his wife and their crew for making this available to us. I will continue to spread the word. Oh, and by the way, my boyfriend Blake is a believer, not only does it work for him, his 9 year old Bassett hound loves it too! Couldn't be more impressed or excited about the leather! This product is a must have!! Everyday since I have been taking noni I keep feeling better! My sleep has improved, my memory has improved and I'm now holding my chiropractor adjustments longer, my energy has improved, the age clock is going back! Couldn't be more impressed or excited about the leather! Thank you so much!! I enjoyed my visit to your farm so much, I became a customer for life during that visit. I take my 2x2 square of Noni every morning. I love the taste, and like to savor it. We use noni bio bandage-love it. We use the Icyheat and Lavender lotions too. I like to add the Lavender lotion to my face lotion. Our pets get a pet size dose of noni as well, in their wet food. I swear by noni and tell my friends and co-workers about Noni Fruit Leather all the time. Our cat has had chronic ear mites his whole life (7 years) and gets on and off ear treatments - medication and medicated washes - every few months. This is the first time he's had clear ears. Completely clear. It's been a year now, and not a sign of ear mites. The only difference in his routine or environment, has been the noni. Thank you so much for what you do! 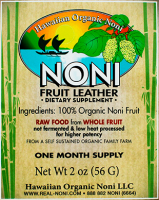 We went to Kauai last September and saw the Noni Leather and Noni lotions at the Farmers Market. We decided to go to the tour at the actual Noni Farm. The tour was very informative. I would recommend everyone to take that tour. We purchased the Noni Leather, Noni Lavender lotion and the IcyHeat Noni Lotion. I have sciatica and the IcyHeat Noni lotion have helped with the pain. Each day I take a 2X2 piece of Noni Leather. In November I took a blood test to check my cholesterol. For the last few months I had gone on vacation and wasn't eating as healthy as I usually do. I would recommend NONI to everyone. It has done WONDERS for me. My spouse and I chew a little noni leather everyday. We've noticed our immune systems are stronger. We also tried the lotion on sore joints and muscles with excellent results. I love this stuff! I was on Kauai in early July and bought the 2oz. Fruit leather. I have since purchased more. I have the recommended piece every day and so do my 3 Samoyeds. The dogs absolutely love it. I have noticed that my blood pressure remains within normal range. The dogs don't have any health problems and the leather will keep them healthy. Their ages are 1 yr., 7 yrs., 11yrs. Have been using icyheat noni lotion for a year now. Whenever I have aches and pain, it is my go to for relief. My 79 year old mom hooked too. 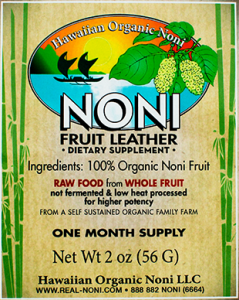 Just bought noni leather, and I already feel better: my digestion has improved, and it has helped with bowel movements. I am a believer! We visited the farm in November, 2017. This was the first time we had been introduced to Noni products. We learned of the properties of Noni, at the farm and decided to start using Noni. Within 7 days something was missing in my life. It was the occurrence of reflux. Now, in May of 2018 I have not had an occurrence of reflux since our visit to the farm and i can sleep soundly. I still sleep with my head elevated however, I am convinced that Noni was the thing that changed my life. Thank God for Noni and the research that Steve and his team perform. This noni leather is wonderful. The company is very helpful in product information. Thank you! All of them! I keep the icyheat noni lotion in my desk at work for relief of low back pain and tension in the neck (from sitting in front of computer a lot ): The IcyHeat feels so great for the muscle aches when I overdo exercising or carrying groceries -- it gives immediate ease and I can get to sleep better. I take the fruit leather daily as an immune system booster, and the BioBandage is excellent protection here in the tropics. I would have a hard time picking a favorite, and I'm so glad I don't have to! Thanks again for making these wonderful natural products. My coworkers told me about your site so I bought both the lotion and the leather and I will be a returning customer. I love that it is organic, family owned farm, and of course all the health benefits. The leather is so portable and much better than the juice. Thank you again for such a great product!